Positioning your agency is crucial for standing out, building a brand, and winning new business. In this guide, we’ll share 7 tips to get your agency positioning perfectly right. The agency world is intensely competitive. Everyone sells the same few services. How do you stand out in a sea of me-too competitors? Positioning is the secret sauce of agency success. It helps you differentiate yourself from the competition. More importantly, it gives your agency a sense of direction and purpose. How do you decide your agency’s positioning? And how can you use it win new agency business? I’ll share some answers in this guide to agency positioning. What do people think of when they think of your agency? Your positioning will give you the answer to this question. Whether clients think of you as affordable or expensive, specialized or generic, small-business friendly or not will depend on how you position yourself. Internally, positioning gives your agency a sense of purpose and discipline. Think of it as the outward projection of your values. Your values tell you who you are; your positioning tells you what you do and who you do it for. For clients, your positioning becomes your differentiating factor. A client that wants a content marketing campaign will prefer an agency that has positioned itself as a content marketing expert, not one that offers generic ‘marketing’. And herein lies the connection between positioning and winning new business. Your positioning creates synergy between what you think of yourself and what the market demands. As author Tim Williams notes, a well-positioned agency strikes a balance between “authenticity and aspiration”. This is crucial for winning new business. In an era where agencies aren’t limited by boundaries, your competition is nearly limitless. Clients don’t want to choose the agency down the road; they want expertise and specialization. In this ‘Age of Authenticity’, they want to work with partners who truly understand their target audience. Your positioning is essentially the signal that tells clients whether you have the experience, insight, and expertise to be worth their time or not. So how exactly do you get picture perfect positioning? What hacks and tactics can you use to get your positioning right? I’ll dig into these questions in the next section. Too often, agencies select their positioning based on beliefs, not market demands. Or they make the mistake of aligning completely with the market, ignoring their own values and aspirations. Your perfect positioning exists somewhere in the middle. Here are 7 tips to help you find it. Your philosophy is a sweeping statement of your beliefs. Your positioning is how these beliefs translate into value for clients. Confusing philosophy and positioning often results in positioning statements that are broad and generic, usually referencing some vague idea of excellence and service. While these might be nice to hear, they don’t really help you stand out. Any agency can claim excellence; what matters is showing prospects what you’re excellent at, and why. For instance, here’s Gold Front’s positioning statement. Notice how it clearly mentions the agency’s expertise (“filmmaking and strategy”) and focus (storytelling). One way to do this is to add market categories (more on this below) to your positioning statements. Here, “technology startups” and “brand marketing” are market categories. I’ll look into establishing categories in more detail below. Essentially, your goal should be to drag your philosophy down to the reality of what you can deliver. Positioning is inherently comparative in nature. How you think of a product or service is usually in reference to something else - a competitor, a market leader, a product category. There is an extensive process of categorization and comparison that takes place with most major purchases. You contextualize products within a category and establish points of reference. Then you compare the offerings to these reference points. A lot of this happens intuitively, especially if you’re an experienced customer. For example, consider how you approach a car purchase. You might look at a model and instinctively categorize it as luxury, family, or sports car based on its design, specs, price, and even its ads (car on a race track = sports car; car in an exotic location = luxury). Once you’ve fixed its category, you might compare the car to the top models in the category. You’ll compare the sports car’s engine to a Corvette, the luxury car’s comfort to a Mercedes, and so on. Effectively, you set reference points and use them to analyze a product. One of the key tenets of good positioning is to help customers establish these reference points. Don’t let them think that your car might be luxury; show them yourself. In this car ad, for instance, the copy explicitly states that the car is “luxury”. Rather, think of the way your target clients categorize and contextualize agencies. Then establish points of reference to help them evaluate your services. These don’t have to be explicit; the way your marketing feels contributes as much to your categorization as what you say. If an SEO agency was to approach its marketing the same way as a creative agency, clients would just end up being confused. They would have no reference points to orient themselves and will just wonder what you really do. What marketing and design conventions do agencies in your category usually follow? How do competing agencies describe themselves? What do agencies in your category focus on in their marketing - case studies, testimonials, portfolio? What is the “bare minimum” in terms of service descriptions and information availability do clients expect from category players? Positioning-based strategy, i.e. a business should focus on positioning itself to gain a competitive advantage. Resource-based strategy, i.e. a business should focus on acquiring resources that help it beat the competition. Focusing on positioning works best when there is little to differentiate between products and raw materials. Coca-Cola, for instance, depends on cheap ingredients and is similar to its competitors. The only way to gain an advantage is through positioning. A resource-based approach to strategy works better in industries where resources are finite. For a mining company, competitive advantage means acquiring more mines. This leaves agencies in a tough spot. The services you sell are often difficult to differentiate. Yet you depend on your ability to acquire better resources (i.e. talented people). What should you focus on in this situation - positioning or resource-acquisition? "It is unarguable that you need both. You need a where-to-play and a how-to-win. They have to be a matched pair. Strategy, at its heart, is about positioning and resources—together"
You’ll find that your positioning influences the kind of resources you attract. And the resources you have impacts which markets you can compete in. For instance, doing an inventory of your resources might reveal that you have a talented pool of writers and SEOs. Given these resources, it makes sense to position yourself as a “content marketing leader”. This will help you attract even more content marketers, thereby strengthening your positioning as a content marketing leader. Why should customers believe that you can deliver on your target positioning? If you claim to be a marketing leader, what have you done to justify it? As simple as this might be, agencies often forget to answer this great ‘why’. They load their positioning statements with platitudes but don’t take the effort of justifying them. Evidence-based: Show proof of your target expertise with case studies, portfolios, public recognition, etc. Experience-based: Show that you have the talent or the experience to deliver on your promises. Listing your staff, focusing on your history, or sharing details of completed projects are some ways of doing this. Authority-based: Prove your expertise by sharing reviews, testimonials, awards, and recognition from authoritative sources. Ideally, you should have a combination of all three in your marketing. Show off your capabilities with your portfolio and case studies, give proof of your experience, and share any public recognition you’ve received. The more you can back up your claims, the stronger your positioning statement will resonate. One of the most dominant ideas in modern marketing is identity marketing. It implies that people buy products that mirror their identity - or at least an idealized version of it. This is why you’ll find that brands like Nike and Coca-Cola seldom talk about their features. Rather, they focus on the “self-image” their customers want to achieve. Companies, like people, also have identities. A company might see itself as serious, methodical, quirky, innovative, fun. Some of this will stem from its culture and values. Some from its people. If you’re selling to a narrow demographic, one of the most powerful positioning tactics you can adopt is to mirror your target audience’s self-image. Figure out what your target businesses identify as. Then reflect it in your marketing. For instance, if your target demographic is tech startups, you might assume that they see themselves as youthful and innovative. Adopting these values into your positioning can help you speak to them better. In contrast, if your target market is dominated by older, more traditional clients, a bold and quirky positioning statement might go against you. Pricing is an inherent part of positioning. You can’t claim to be “for everyone” if your services are priced beyond the reach of everyone. Benefits closely follow pricing. The extent and speed of your results will depend on the price you charge for your services. A high-priced service can afford to devote more (and better) resources to a problem, delivering benefits faster. One way to analyze competitors is to create a price-benefit-positioning map. Your goal is to figure out if there is consistency across these three quantities. If a service is priced cheap, is it also positioned as a budget service? And if it is, how do its promised benefits differ from a high-end service’s? Do this for all your top competitors. This can help you spot opportunities and weak positioning. You might notice that a competitor is over-charging but under-delivering, even as it positions itself as a market leader. You can undercut them by offering fair prices and better delivery while focusing on the value of your services. What agencies think of themselves as, and what they actually are, is rarely in agreement. It’s easy for confirmation bias to sneak in. An agency might see itself as “X”, even when there is no evidence for it in its positioning. It’s important to take a step back and view your positioning from a neutral angle. Be honest about your capabilities. If you don’t have a rich history, don’t hark on your experience and heritage. If your portfolio doesn’t include some exceptionally creative work, don’t loudly declare “creativity” as your chief value. While being honest is obviously good, you can’t risk being too honest. A positioning statement is as much a declaration of what you want to be, as what you are. It’s okay to exaggerate a little as long as you’re honest about meeting that exaggerated position. You don’t have to win 10 awards to claim that you’re the “best” in your city (though the awards help). Find a happy medium between authenticity and aspiration, and you’ll be good. Agency positioning is complex and challenging. It’s also crucial for standing out in a crowded, undifferentiated market. These 7 tips will help you position your agency better. Positioning is only one aspect of running an agency, of course. You also need to serve your clients effectively. 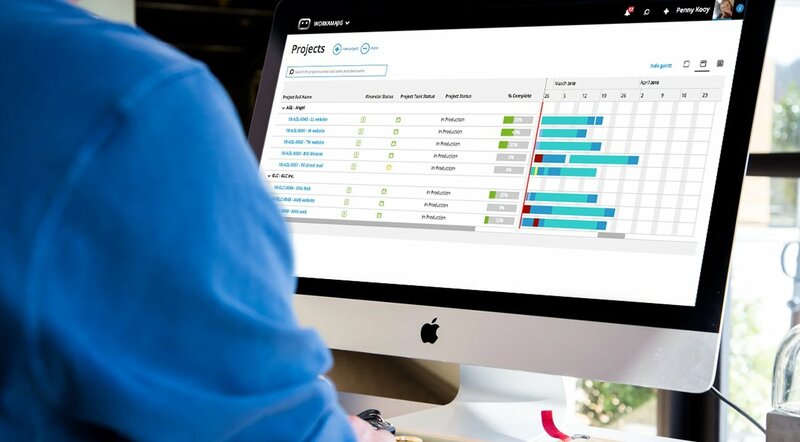 A good project management software goes a long way towards ensuring your agency’s wheels are spinning smoothly. Give Workamajig a try to see how it can transform your agency’s operations.